James Patrick "Jim" Cannon was an American Trotskyist and a leader of the Socialist Workers Party. 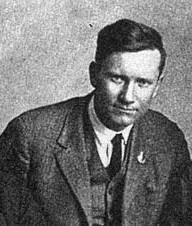 Born on February 11, 1890 in Rosedale, Kansas, he joined the Socialist Party of America in 1908 and the Industrial Workers of the World in 1911. He was personally trained by "Big Bill" Haywood, a top IWW leader, and was an IWW organizer throughout the Midwest from 1912 through 1914. Following his expulsion from the Communist Party USA in 1928, Cannon was national secretary of the Communist League of America, Workers Party of the United States and Socialist Workers Party until his retirement and move to California in 1953. He was national chairman emeritus of the SWP when he died in Los Angeles on August 21, 1974.